Recently I was at The Balvenie 50yo / David Stuart Celebration and had a night of tasting The Balvenie, more Balvenie, and a wee dram more Balvenie. Never had I had so much of The Balvenie let alone The Balvenie in isolation, and to be honest I absolutely loved it. Prior to the event I had secured a bottle of the The Balvenie Golden Cask, supplied to me by fellow member The Grey Bush, but I had never opened it (certainly to happening soon) but before I could open that I simply had to get my hot little hands on a bottle of The Balvenie Double Wood 12yo. Booty Calls! Well that time has now come and I have been pretty excited about getting this done. Before I begin it would be good to note that The Balvenie Master Distiller, David Stuart, has been in the game now a good 50 years so he certainly knows his stuff and it can only be assumed nothing bad could be coming out of The Balvenie stables. Also of note is that The Balvenie is in fact part of the greater WIlliam Grant & Sons Ltd company since 1898, neighbors the Grants distillery, and is also what you might call the sister distillery to Glenfiddich, William Grant & Sons other Single Malt distillery. That's a whole lot of lovin' in one small town. Seriously would you not want to live in Duff Town? Nose: Alluring mild coffee smoke, toasted woods, toffees, and a spicy roasted almond edge. Lot's of high notes and the sherry sweet overtures are obvious. Taste: Very delicate across the tongue with ample pallet saturation. A complex honey sweetness appears instantly as does a mild musty woodiness. Again the coffee smoke and spicy roasted almonds are announced towards the end that linger on for a good while. Finish: Medium to long and warming in the chest right up to checks of the mouth with a mild dryness appearing on the tongue, effectively leading you to crave another sip. Overall: Very pallet excitable with flavours working together in a rounded harmony. Though the mild mustiness is present I think without it the whisky would be too sweet for my tastes. This is not a whisky I have found that enjoys food or other whiskies to be consumed around the same time. It is very stand alone and to be consumed in isolation as its fine details I have found are eclipsed all too quickly. 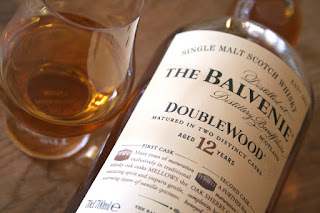 As a matter of fact when I have tried any Balvenie at a whisky event like Whisky Live or Whisky Fair I have always been very disappointed as I could virtually not taste them at all due to my pallet already being broken in earlier tastings. I would love to see this at a higher ABV like 46% as I think the flavours would really be enriched. A solid 6 out of 7 for this little angle and very happy to have tried it. I will certainly be laying my bets I'll be buying another bottle in the near future, once I have consumed my 2nd bottle of The Balvenie Golden Cask (yet to be opened and reviewed).